We know that access to clean, safe water changes lives. When a well is installed or restored in a community or a rain water catch system is developed in a village, girls return to school. Women begin small businesses. Men are no longer too sick to work. Fields are watered and food supply becomes more reliable. Health returns and children grow up to be productive members of their community. The cycle of poverty is broken. Lives change. 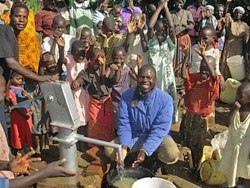 Our goal is $5000 so water can be provided for needy villages in Kenya. We want to be involved in the movement to end the global water crisis through partnerships with organizations like The Water Project.